A lot of people have been asking me about Kili and how come I've been making few posts/videos lately. The truth is, I'm just taking it easy on the birds for now. Truman is finally eating, back in his cage, and moving about but he still limps pretty badly. I maintain the tricks he knows but don't think it's a good idea yet to start working on new ones. Meanwhile Kili is still going through the heavy stages of her second molt. She looks kind of scraggly and she has been nippy lately. With so many wing feathers missing, right now it's more important for me to promote good nutrition and avoid feather breakings so that she could fly again. I don't make Kili fly much and only practice old tricks with her when she's up for it. Believe it or not, every few days she just really wants to do tricks (even though she isn't hungry) so I give her a chance to run through her routine. Though not in 2 minutes, she does get through all the tricks she knows in under 5 minutes at a leisurely pace. She definitely remembers everything and knows what to do very well. Kili currently has 2 primaries growing in on her bad wing and one primary on the good one. 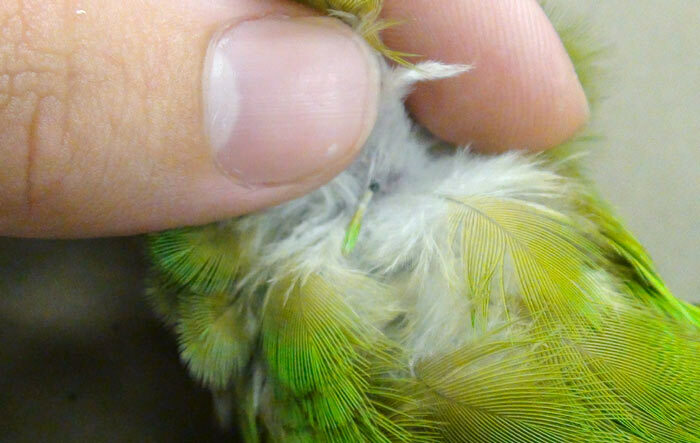 She also has some secondaries as well as many body feathers coming in now all at once. I'm feeding her a near 100% Roudybush pellet diet in abundance. I'm avoiding feeding her much seeds or fresh foods as they would dilute the high nutrition of the pellets. Between molts I believe the fresh foods help keep the weight in check but right now I really need her to grow back strong healthy feathers. You can see that Kili is missing a lot of primaries but 2 new ones are growing in. When Kili is molting she cycles between phases of being really nippy and really cuddly. It seems that the molt goes on in phases. First she loses a lot of feathers, then stops losing feathers while the previous set grows in, then she begins losing feathers again. She's nippy between the feather loss and pin feathers coming out stage but then she gets super cuddly and is always begging for scratches when the pin feathers have matured. 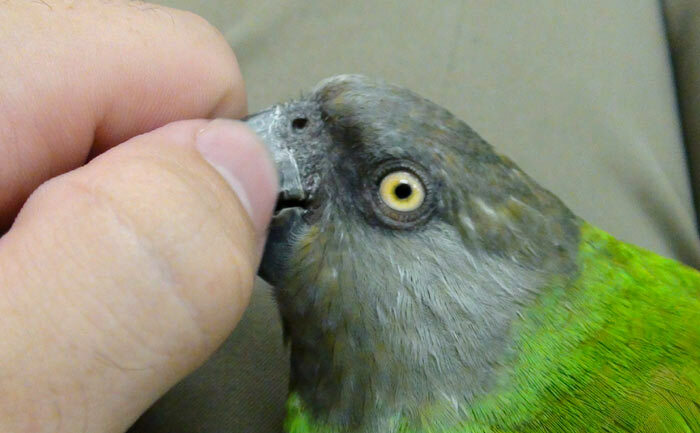 I roll the pin feathers on her head between my fingers to help break them open for her. 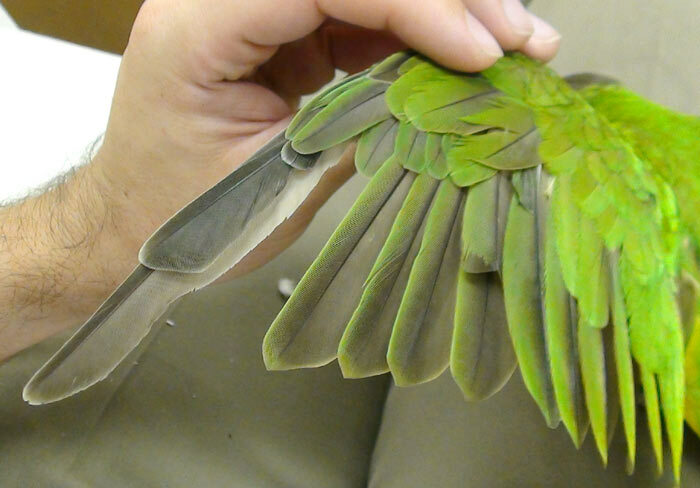 In this video you can see a comparison of Kili's good and bad wing, see how her new primaries are growing out, watch me scratching her head and beak, see a pin feather up close, and see how I rub the feather between my fingers so it comes open. If you listen really closely, you can even hear Kili purr in delight. I love listening to her purring. How cute. Her feathers look fantastic. I'm glad you're giving her a break from all the other types of food and using the nutritional value in the pellets to help with the feather growth. The pin feather close-up is really great to see. I usually put on my reading glasses (just one of those things you have to deal with when age sets in) and look closely at the pins that the birds can't reach around the head, neck and face. If the pins aren't blood feathers, and the feather is sticking out of the sheath, then I roll them and even pinch the tip of the shaft with my nails to help start it cracking. 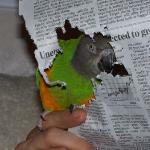 My birds seem to really enjoy that. Thanks for letting us know that Kili is doing well. I hope Truman's recovery is still on track. Poor guy.